Quinn is missing, but Sookie thinks that he is just cold-shouldering her after he saw her swapping blood with Eric (deepening their bond, but done, on Sookie’s behalf, out of desperation). Then there are more problems with the Pelts and needs to deal with that. Plus there are problems between her brother and his new bride, and of course, there is stuff happening with the vampires. Oh, and Eric has regained his memories from the time when he was under a spell. Things are complicated for Sookie. Yet, no loving. 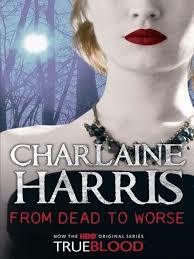 Really, Charlaine Harris, come on! It’s been a couple of books since Sookie enjoyed any romantic involvement. It’s like you’re trying to make this about more than just the romance. Still, I liked the Were story in this one – the mystery element worked, and then there was a surprise and a big fight.